Ammoniation: something to consider this year? Ammoniation of crop residues can turn a low-quality forage into a medium-quality forage that can maintain a dry cow without supplementation. Given the drought in the Northern Plains and eastern Montana, forage may be hard to find this fall for some beef cow producers. Ammoniation of low-quality crop residues such as wheat straw and corn residue or low-quality CRP (conservation reserve program) hay may be worth considering, depending on the price and availability of medium-quality hay. Ammoniation is not a new technology but can be used to make these low-quality forages have digestibility and protein content that is equivalent to that of medium-quality grass hay. Ammoniation of low-quality forages is relatively easy to do, although working with anhydrous ammonia can be dangerous and proper safety precautions must be taken. Prepare a site for ammoniation by scraping an area that will accommodate the stack of bales plus an additional 5 to 6 feet on either side and in the front and back. Push the dirt to the sides of the area where the bales will be stacked. The dirt will be used to seal the plastic around the edges that will cover the stack of bales. Gather bales into rows that are stacked. If using round bales, stack in a pyramid leaving a couple of inches between pyramids for the ammonia to filter around the bales. For instance, three bales on the base, two bales on the second level, and one bale on top. Cover the entire stack with one sheet of 6- to 8-millimeter black plastic. If the plastic is 40 by 100 feet, you will be able to cover 10 to 12 pyramids in a row. Make sure the edges of plastic on the ground are sealed with loose soil to prevent leaking of ammonia. Any holes in the plastic have to be patched using duct tape to prevent the loss of ammonia. To determine the cost of ammoniating low-quality residue, use local prices. For example, if anhydrous ammonia is priced at $500 per ton, this equates to 25 cents per pound. It is suggested that you use 60 pounds of anhydrous per ton of dry matter (DM). If your residue was 90 percent DM, you would need to add 54 pounds of anhydrous per ton of residue and the cost of the anhydrous would be $13.50 per ton (as fed). The plastic will cost about $7 per ton. If labor was $3 per ton and machinery costs are $1.70 per ton, then the total ammoniation estimated cost, not including the residue, would be $25.20 per ton. Right now, corn residue is being sold for around $40 per ton, making $65 per ton the total cost (as fed). If the cost seems reasonable, next determine how much anhydrous will be needed. If the stack is arranged in pyramids (three-bale base, two bales in the middle, one bale on top) 14 bales long, there would be a total of 84 bales. If each bale weighed 1,200 pounds, there would be 50.4 total tons of residue. If the residue was 90 percent DM, there would be 45.4 tons (50.4 tons x 0.90 = 45.4 tons) of DM. You will want to add 60 pounds of anhydrous ammonia per ton of forage DM (3 percent). In this example, you will need 2,724 pounds of anhydrous ammonia (45.5 tons DM x 60 = 2,745 pounds). Remember, the ammoniation process is temperature dependent and occurs faster at higher environmental temperatures. Black plastic is recommended, as it collects heat from the sun (it is also more resistant to deterioration from ultraviolet light than other colors). This is also why it works so well with straw harvested and ammoniated in the summer. However, this does not mean that it can’t be done successfully even in late fall after corn residue is harvested. Last year, we ammoniated corn residue starting in early November and were able to achieve a 10 percentage unit boost in digestibility from 50 percent total digestible nutrients (TDN) to 60 percent TDN plus increase the crude protein (CP) content 5 percentage units up to a total of 9 percent CP. When ammoniating during cooler ambient temperature, the key is to leave the stack sealed longer. At a temperature of 86°F or above, you only have to leave the stack sealed for seven days. At temperatures of 60°F to 86°F, you need to leave it sealed for two to four weeks, and when below 60°F, keep it sealed for four to eight weeks. Ammoniation can transform low-quality forage into forage that can maintain a dry cow without supplementation. The value of ammoniation will depend on the availability and cost of other forages (such as medium-quality hay) and the cost of anhydrous ammonia. Given current conditions, this may be the year for some to consider ammoniation of low-quality forages to feed their herds as anhydrous ammonia prices are currently at a four-year low, ranging from $400 to $500 per ton. 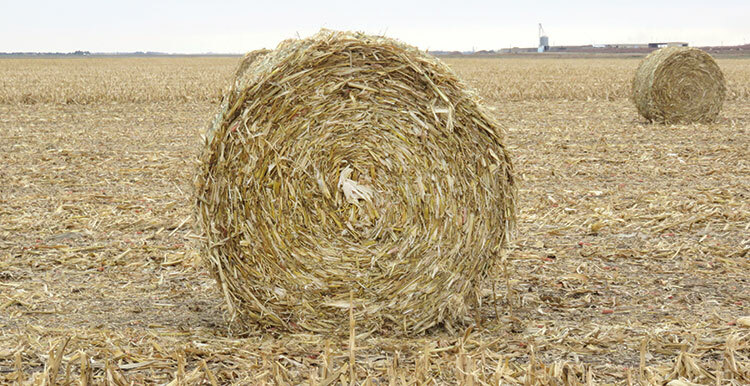 Further, medium-quality hay may be hard to find in some regions of the U.S. this fall. 1. DO NOT ammoniate medium- or high-quality forages as this can cause toxicity due to the reaction of soluble sugars with ammonia. 2. The ammonia can be applied through a hose or pipe extending from the tank under the plastic and terminating near the center of the stack. Placement of the end of the hose or pipe is not critical if the stack is on level ground. However, if the forage is stacked on a slope, inject the ammonia at the higher end of the stack. 3. The reaction requires some moisture (at least 10 percent with an optimal moisture of 15 to 18 percent). It is best to bale straw or stover as soon after harvest as possible or early in the morning when there is some dew present. 4. Apply ammonia slowly (no more than 30 pounds of ammonia per minute) to minimize ballooning and stretching of the plastic. Anhydrous ammonia expands from a liquid to a gas when it is released from the pressure of the tank. For more information on ammoniation, visit beef.unl.edu. This article appeared in the August/September 2017 issue of Hay & Forage Grower on pages 8 and 9.